As businesses grew increasingly reliant on electronic communication, experts assumed the era of the paperless office was upon us. Despite this, shops, restaurants, salons, law firms and small manufacturing firms still have difficulty converting to a paperless office. Learning how to go paperless helps reduce office waste, saves time, helps securely store important documents and may save a few trees! 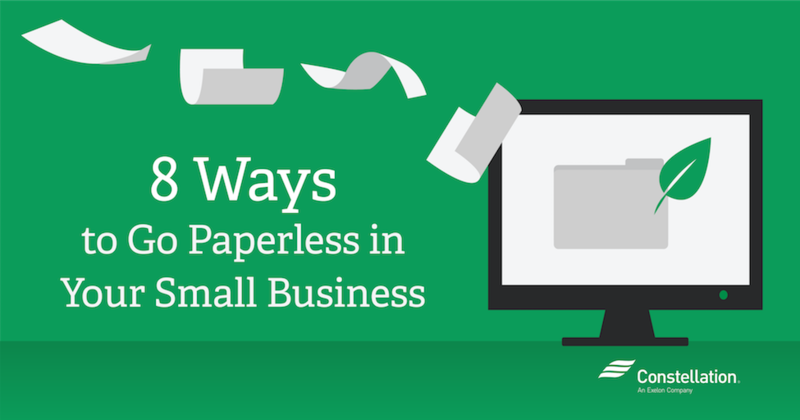 As a small business, there are many benefits of going paperless. Up to 50 percent of business waste is paper, so you’ll greatly reduce your impact on the local landfill by going paperless. Converting to a paperless office can also support earth-friendly efforts like water conservation, since each sheet of paper takes an average of five liters of water to make! 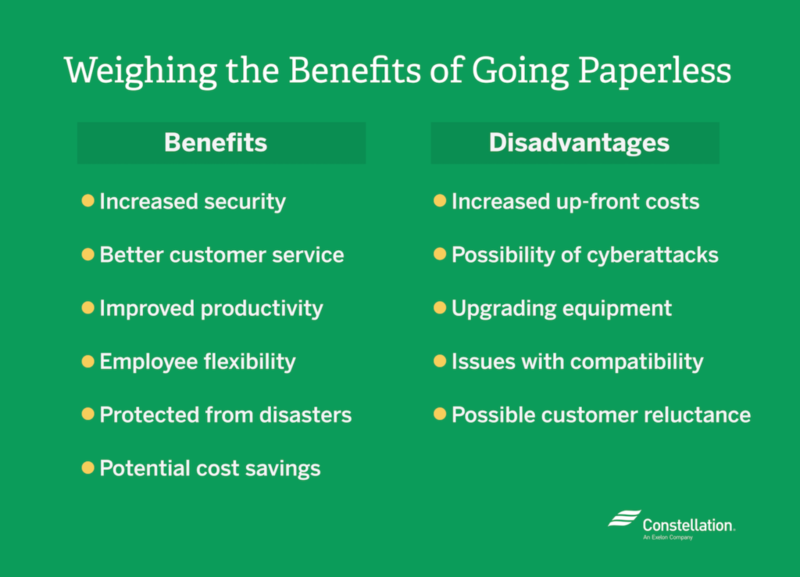 From a purely financial standpoint, going paperless can save on office supply costs: the average American office worker goes through 10,000 sheets of paper annually. The cost of replacing black ink cartridges three times a year for a single printer ranges from $60 to $120, while color cartridges can cost $75 to $160 on the same purchasing schedule. If you add in the cost of pens and printers and the energy required to print documents, the financial importance of a paperless office becomes clear. You need a strategy before going paperless in your small business. You don’t have to go completely paper-free all at once: pick one or two ways to go paperless, put them into practice and then move on to other areas. If you need some help getting started, here are eight handy paperless office tips. Implement paperless document storage. More commonly known as the cloud, paperless document storage allows you to securely store and backup important files and documents. In addition to reducing paper use, paperless document storage allows you to share files with employees and customers without the cost of faxing or mail services. Off-site file storage gives you added security and complete control over who can access documents. Move to paperless meetings. Instead of printing handouts for meetings, take advantage of information sharing technology. A simple HDMI cable is all that’s needed to cast a slideshow presentation from your laptop or phone to a television or projector. At the end of the meeting, the presentation can then be shared with participants through the cloud. Use electronic communication. One of the easiest ways to go paperless is available through any computer: email. Email offers faster communication than sending letters, you generally get a faster response from the recipient and you have a copy of all communication on your computer. Using text messaging to send memos is increasingly popular, and you can reduce paper waste by opting for paperless billing for telephone, internet and utility bills. Finally, electronic calendars enable small businesses to schedule conference calls, client calls, meetings and time off without wasting paper. Copy documents with scanners and scanner apps. What do you do with existing paper documents while you’re converting to a paperless office? One option is to scan them into PDF format and upload the copies to the cloud. You can use a printer’s scanner or download a scanning app to your tablet or phone. As a security precaution, shred documents after uploading them. If you absolutely need hard copies of a document, store them in a safety deposit box as part of your business’s disaster recovery plan. Switch to digital receipts. Digital receipts are ideal for salons, restaurants, retail shops and similar small businesses and have advantages for both you and your customers. A digital receipt doesn’t fade with time, leaving the customer guessing at the amount paid. They can be tailored to specific customers and save time during transactions. Digital receipts also lower your paper and ink costs. 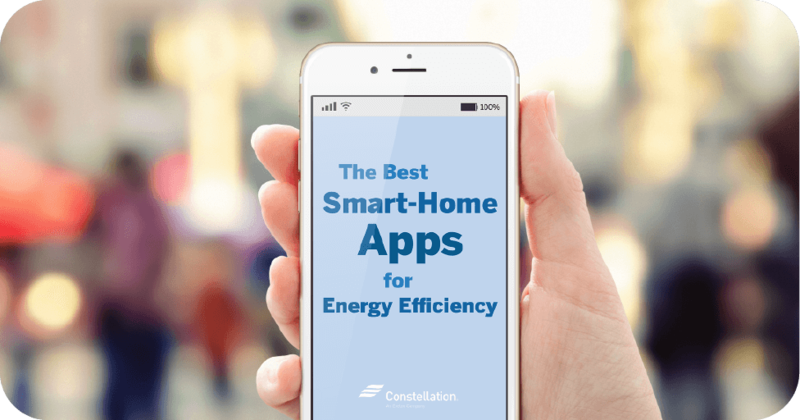 Invest in energy-efficient equipment. One of the potential disadvantages of going paperless is a possible increase in energy consumption as employees switch to reading documents through electronic devices. Installing LED lighting, energy-efficient printers and other energy-saving equipment helps offset the cost of increased electronic usage. Lease expensive equipment. 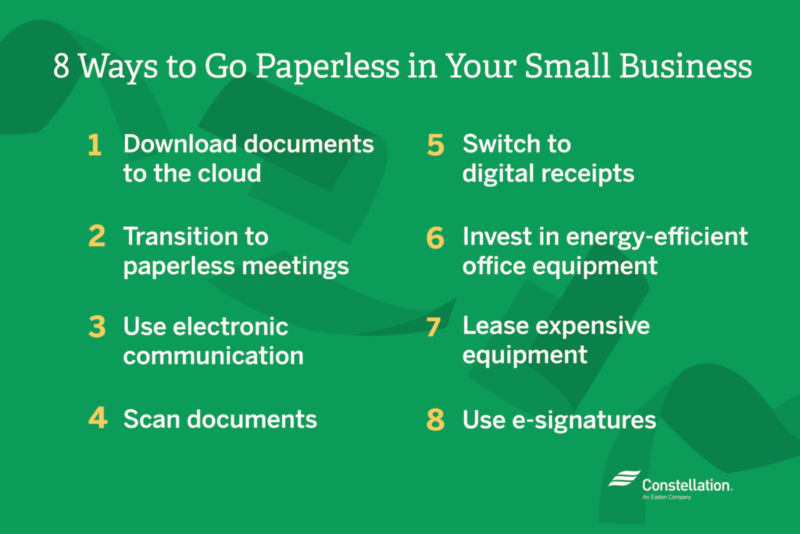 Going paperless in a small business may require purchasing new laptops, tablets and portable digital payment devices, which can be costly. By leasing expensive equipment, you can save on up-front costs, repairs, upgrades and equipment maintenance fees. Use e-signatures. Signing contracts and agreements no longer means printing out long documents for a couple of signatures. E-signatures are considered legally binding and allow you and your clients to review and sign documents anywhere, making them particularly popular ways to go paperless in salons, offices and shops. Increased accessibility: File sharing with clients and employees is easy. Electronic searches allow you to locate documents quickly from anywhere you have an internet connection. Increased security: Digital documents are stored on secure off-site servers and are only accessible by authorized users. Better customer service: A quick electronic document search brings up all relevant customer data, including customer orders, allowing you to provide more effective customer service in a timely manner. Improved productivity: Employees spend less time handling and printing documents, allowing them to focus on important tasks. Employee flexibility: As employees access needed documents through the cloud, telecommuting and virtual work become a possibility. Fewer people in the office means lower energy costs, and virtual employees usually work from their own computers, reducing equipment needs. Space savings: Medical offices and other businesses that must comply with strict regulations have to keep records for many years, which presents storage challenges. One of the great benefits of going paperless is the ability to store documents virtually, freeing up room in the office. Protected from disasters: Going paperless positively affects your business disaster plan. As virtual documents are stored off-site in secure locations, they are safe from fire, theft and any other disasters that might strike your office. Potential cost savings: The financial importance of a paperless office cannot be overstated. Once you understand how to go paperless, you can save on printing costs, fax and printer equipment, pens, and—of course—paper. By sending documents electronically, you save on mailing and shipping costs. Positive customer opinion: Customers who value eco-friendly approaches to business will have a better opinion of your office and your sustainable workplace practices, while technologically savvy customers will appreciate the efficiency of paperless customer service. Going paperless is not without its challenges. As with any business decision, you must consider the potential disadvantages to a paperless office. Increased up-front costs: The benefits of going paperless include reduced operating costs, but these may not be worth the expense of new electronic equipment, installation fees and the costs of paperless document storage. Possibility of cyberattacks: Cloud-based documents are at risk of cyberattacks and information breaches that could put sensitive data at risk. To reduce that risk, store copies of your documentation on an external hard drive as well as in the cloud, and grant users online access to the individual documents they need, not the entire collection. Upgrading office equipment: Despite the many ways to go paperless, most offices still need a printer or copier. Older models may need replacing with newer models as part of your energy conservation efforts, which can be expensive. 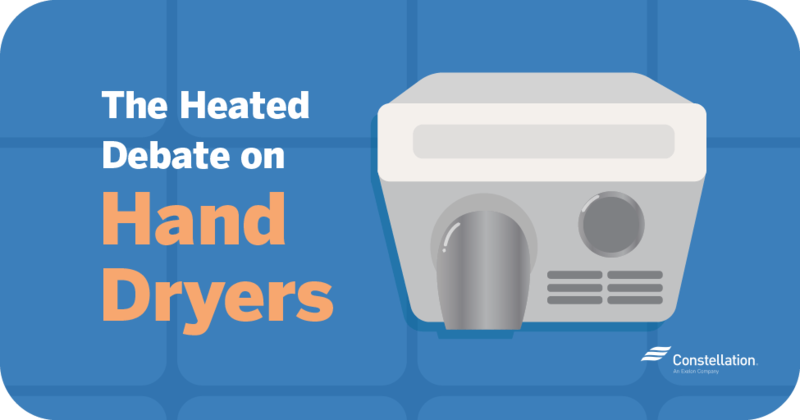 Not replacing older and energy-hungry equipment may offset any savings from your paperless efforts. Issues with compatibility: Just because you’ve gone paperless doesn’t mean your business contacts have. This can lead to communication problems and a need to use paper in business-to-business dealings. Possible customer reluctance: While many people are quick to embrace paperless technology, over half of all customers still prefer to receive paper statements. Before committing to a paperless system, be sure your customers are willing to accept online documents in lieu of hard copies. Now that you know how to go paperless, the question is, will you do it? Only you know whether your business and customers are ready for a paperless workplace. Paperless businesses face their own challenges, and no system is perfect, but for businesses that want a more efficient and secure method of documentation, a paperless office is an ideal choice. For others, the cost of equipment and recycling digital equipment may be higher than that of a paperless solution. You know your business best. Make the choice that’s right for you! Great ideas for going paperless but it is still hard since I find editing documents easier when you print them out. Sometimes going paperless may not work well for workflows! We encourage everyone to choose which works best for them. Thanks for contributing to the conversation! Hi Simn, proper procedures depend on your industry, location, and financial situation. 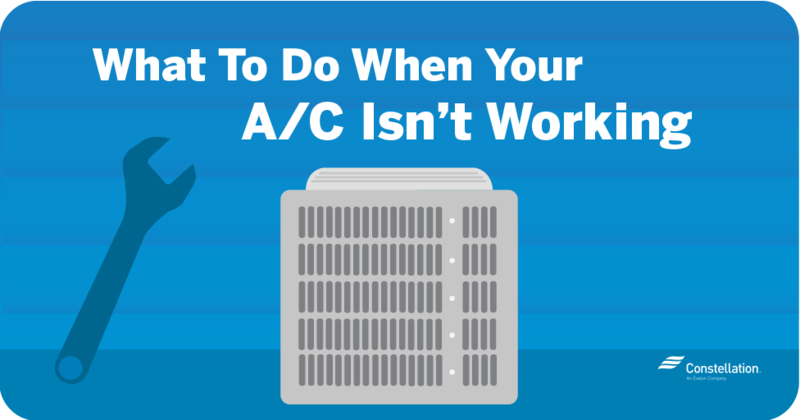 We suggest looking researching your specific situation first before determining next steps/procedures!